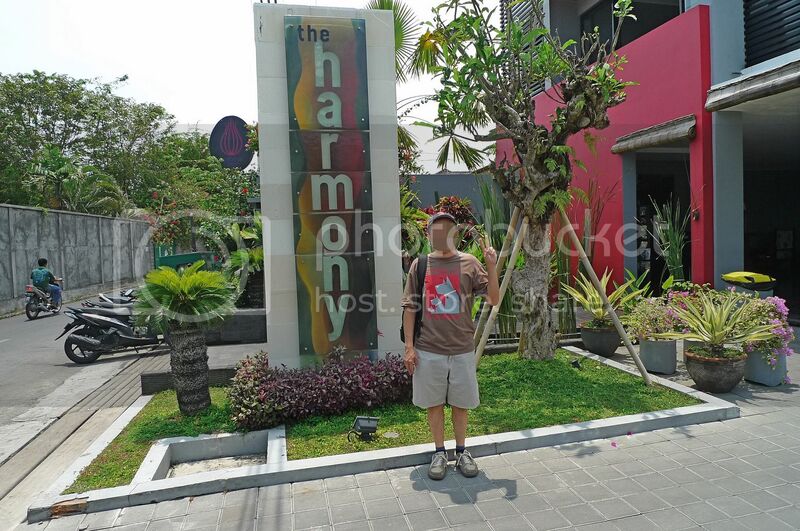 During my recent trip to Bali, I stayed at the Harmony Hotel at Jalan Drupadi in Seminyak. 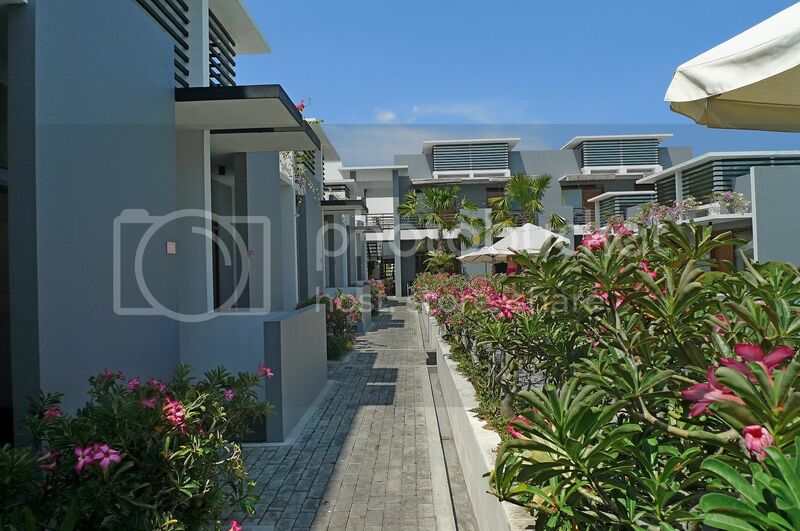 Located just within 20 minutes drive from the Ngurah Rai International Airport, and 15 minutes to Kuta Beach and 1 hour to Ubud, it was undoubtedly, very convenient. This hotel seemed to like desert rose (or prosperity flowers) a lot as I could see lots of them lining up the walkway as me and my friend walked towards our room. They also have one of the smallest mini swimming pools I have ever seen! 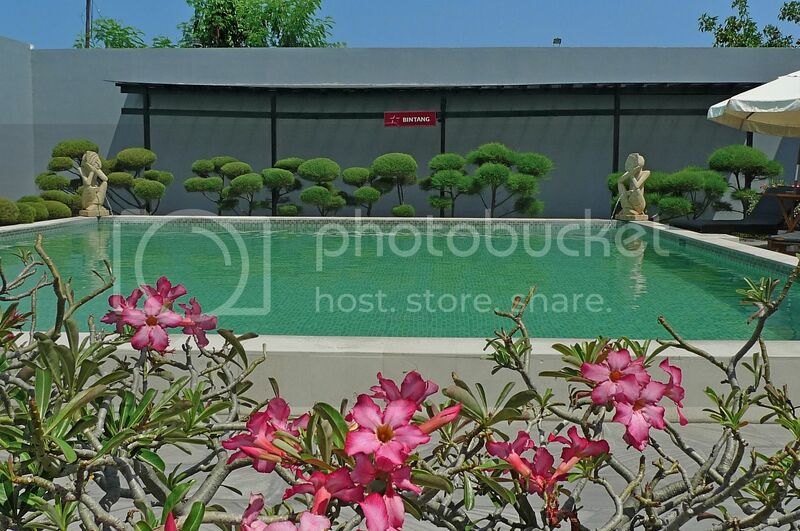 See that two statues at the two corners of the pool? They are shooting out water from their you-know-where! Let me magnify a bit. I can't imagine anyone doing that pose while urinating, haha!! Our room was located on the first floor. We made our way up the staircase. 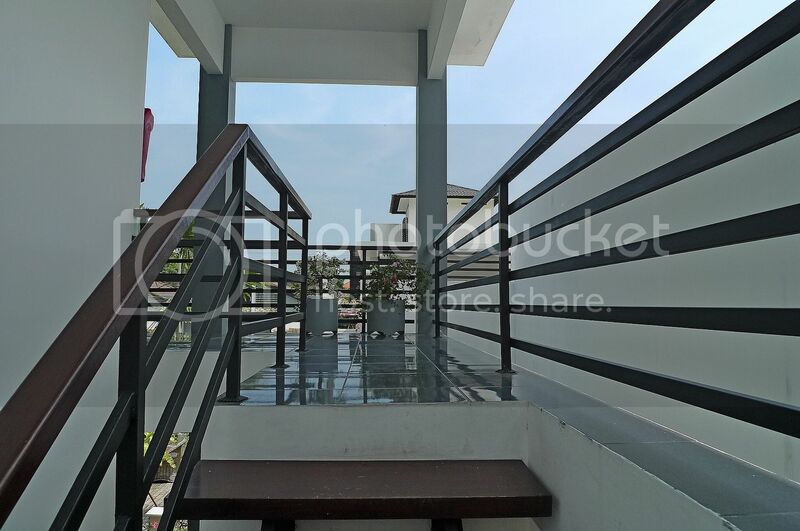 This is the view of the swimming pool from the first floor. Now don't you think it's a pretty tiny pool? This was our room. 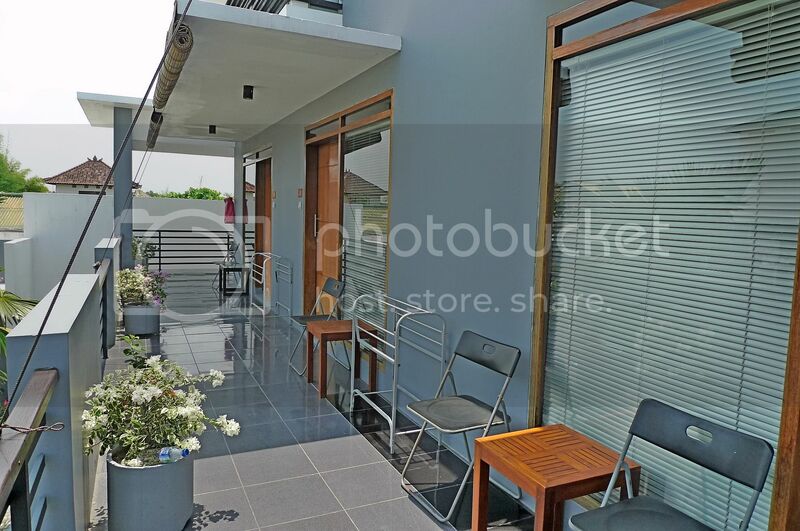 Pretty clean and decent for 500,000 rupiah (RM185) a night! They even have a table for your laptop. By the way, wi-fi is available free here. But I did not bring my laptop so did not make much use of it! 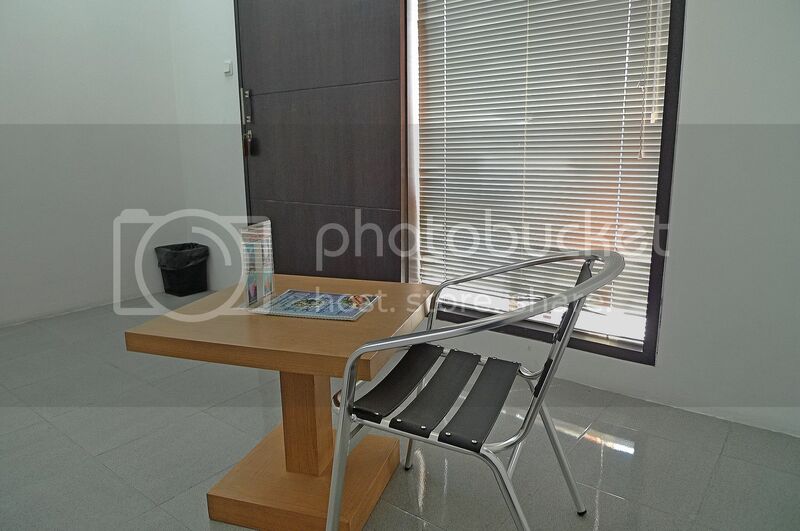 Anyway, we would need to move this table aside to place one extra bed for our friend who would be arriving later on the second day. By the way, I did not take photos of the bathroom as I hate taking photos of bathroom although this one was reasonably clean! This is the view of the corridor outside our room. I also like it that our room faces the swimming pool. Nice! I was really surprised that there were no fan or air conditioning at the lobby of this hotel! It was so hot! Luckily there was some breeze blowing otherwise I would be half cooked! Actually, I later learnt that a lot of places in Bali were quite environmental friendly meaning they have no air cons and fans! I don't know about you, but I need the air-con or at least the fan! How to survive without one? Luckily, there was air conditioning in all the rooms. If there was none in my hotel room, I would have moved out! Serious! 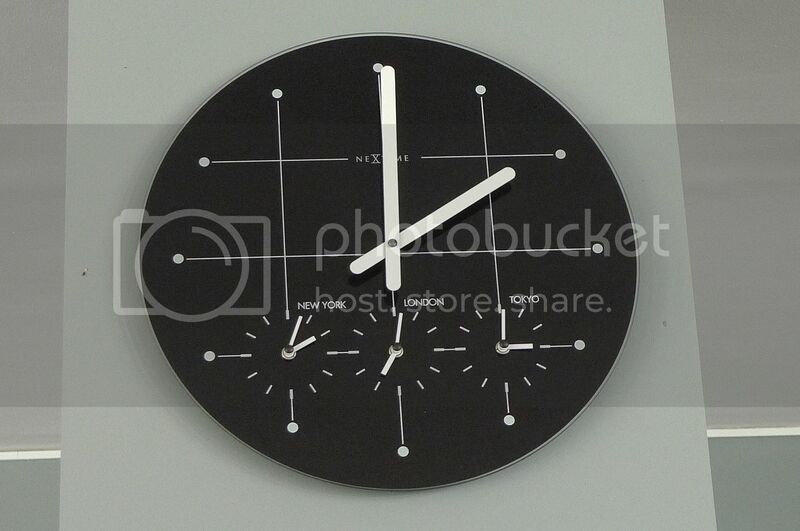 Clock on the wall showing international time. See that cigarette ashtray and fruits on the table? No those were not real fruits, haha! But that's a real ashtray. And I seemed to find similar looking ashtrays all over Bali! This is the staircase leading up to the dining room of the hotel. 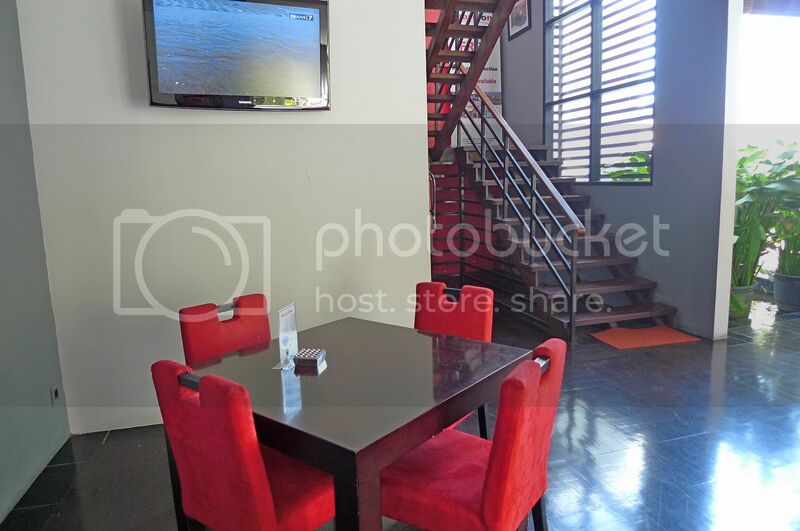 I took a photo of the dining area while I was sitting down eating my breakfast. In case you want to ask, no that bag and spectacles do not belong to me. It was my friend's! Haha. Do you see the two desktops there? Yes, I went online using these computers to leave my tweets and check on my Facebook updates and emails. As you can see, it's tough not to go online even for one day! LOL! Fortunately or unfortunately, the speed was so slow I did not log in for too long! Otherwise, I would have updated my blog too! Haha! This was what I ate for breakfast on my second day in Bali. The breakfasts were all complimentary or if say it another way round, included in the price of the hotel accommodation. 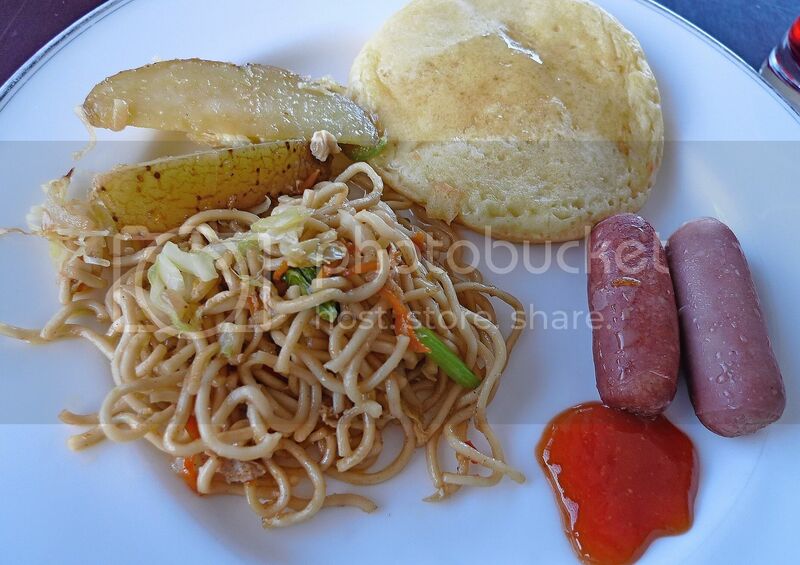 This is the breakfast I ate on my third day in Bali. Notice the food common in both the breakfasts? Yes, it's the sausages! Let me tell you, those sausages were to die for!! I took many, many rounds of them! So yummy!! Maybe you want to ask why I did not load my plate full with those delicious sausages? Well, I didn't because I did not want others to scowl at me. Hahaha!! Well, the food was really nice but as usual there was no air con or fan here, so I ate in the heat with sweat dripping from my head to the food on my plate. Yikes! OK, I just exaggerated, haha! I think you got an idea what I ate for breakfast at this hotel right? Good, no need for me to show my breakfast food for Day 4 and 5. They were pretty much the same thing. LOL! And each time, without fail, I would eat those yummy sausages!! Yum! Yum! Wah! Can't believe my luck! I'm FC today! Wohoo!!!!!! The hotel look nice. Nice view of the pool there too. If I got nothing to do and not going out to sightsee, I could just sit outside the room and soak in the atmosphere. Foong, so good ah you, didn't eat too many of the yummy sausages? Some more, eat so little? do your followers here have loose screws that need to be tightened or they think spamming is an entertaining artform or laughable joke? omg! i love the place! 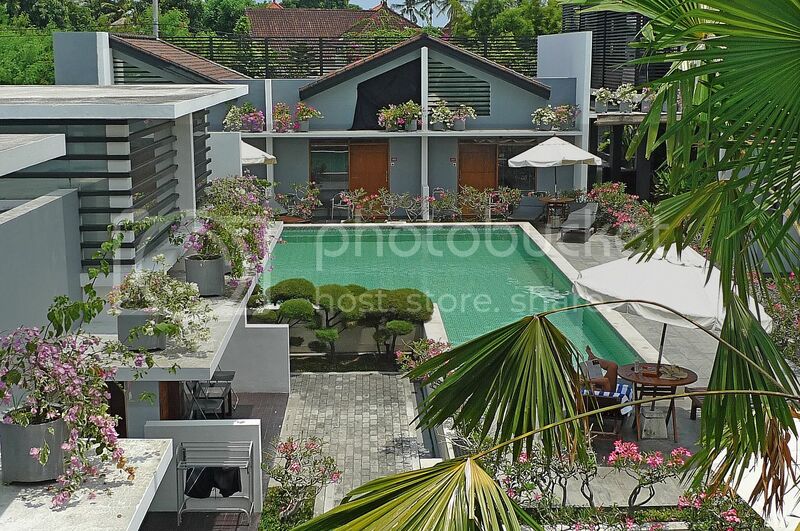 doesnt look like hotel at all eh.. more to villa or a house. haha. wow.. so many pics, foong.. my pc cannot load up all, i wonder why.. big resolution? some came out half half, some full and two missing.. hahahhaa... anyway, nice ambience, really relaxing! simple food yet yummy, right? That's a awesome hotel, the interior decoration is so beautiful, the swimming pool is also very nice, beautiful view. We might have loose screws somewhere but we have manners. We don't spam unless we know we know we are welcomed to do so. And we don't spam with things that are offensive to other readers nor do we look down on anyone. Gosh! PMS is at its peak today for me! now i see how you look like. grrrg i don't know what's wrong with my PC today, it the loading process takes forever!! hey where's the cigarette? i can only see fruits..
i think they love to serve that sausage... or is it a sausage??? Just kidding, i wont do that! the food look normal... nothing special. but the environment is look nice. Your pose is so cute ler. hahaha :D Aiyoh...until now you still wanna blank your face? :p Don;t lar shy shy! If those were not real fruits...why on earth they wanna place it there? the hotel looks good. 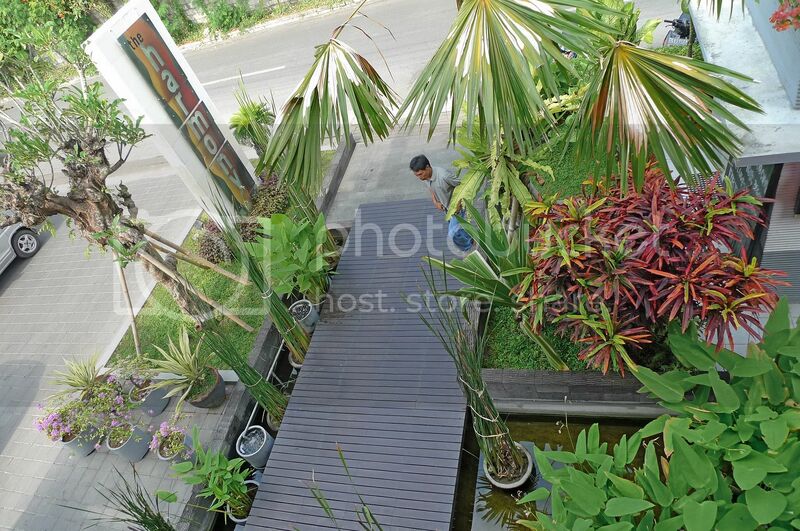 i will look out for this hotel should i go Bali one day.. I noticed the two long thing in common for ur breakfast.. one is pink/red another so pale like it had worked OT the previous nite.. lol... omg..
Ehh... I thought your indentity exposed already, why still need to censore your face??? Wonderful trip, lovely swimming pool, neat and comfy hotel room, simple breakfast, great companion and most of all... excellent environment! Have a nice day! Aiyo it reminds me of Maldives resort, with no aircon too! But at least there were fans! Those sausages really that yummy? Should have bought some of them back mar! 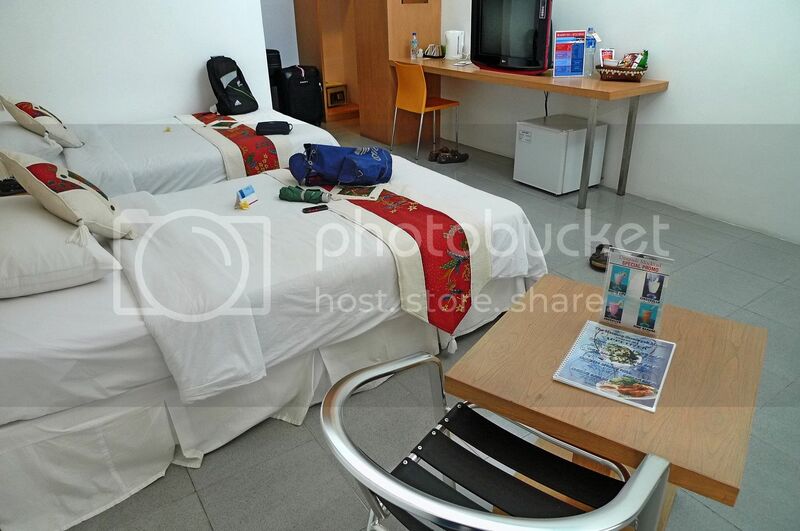 :P The room looks nice and tidy.. but with a 3rd bed inside, wouldn't it be a bit cramped? Oh delicious sausages? Heard of live to eat or eat to live never eat to die woh or die to eat hahaha..Must be real real real reallllllll yummy. lina, congrats for being FC! Long time already yes? Haha! You also like me cannot survive without fan and air-con! 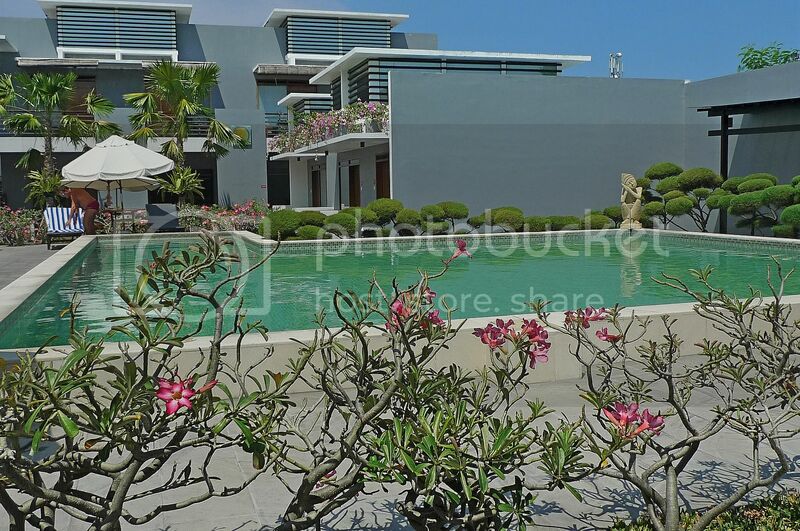 Yes, the swimming pool is nice but I won't sit outside by the pool cos the sun is burning hot in Bali!! Actually, I took many rounds of that sausages. The plate you see in my photo above is the first round only, haha! james, our kind of spamming is different in the sense that it's more like a conversation between my readers and me. To me, it's fun! I do not condone the conventional spamming which is not related to the topics in my post or to serve as some form of advertisement for the spammer. But I do not comment spam on other blogs unless they welcome me to do so. caroline ng, yes more like a villa than a hotel right? Yes it's me! I'm fat? Excuse me, I cannot be as thin as you! In fact, I hope to put on some more weight la! Yes, I tweeted in Bali using the slow speed computer in the hotel, not via my handphone or laptop! It's too darn expensive to tweet using handphone there! lina, thanks for the response. Appreciate it! So good also your PMS is at the peak! Haha!! bluedreamer27, maybe it's the slow internet connection? Don't worry - no ghostly experience in Bali this time. Haha. The cigarette ashtray is on the left side of the fruits. Can you see it now? tekkaus, seminyak = one oil? Haha! Looks vacated? Yeah, cos I purposely took the photos when no one was around! Haha! Yes, you are right. Luckily the Internet connection was slow, I could enjoy my trip without itching to go online! Haha. bananaz, how you know the pool can accommodate 200 people? You measured it? LOL! Actually can accommodate 100 gwai lous only but 200 Asians cos gwai lous are bigger size! Hahaha!! merryn, haha, I definitely not botak! But then again, maybe it's me in disguise! Haha!! alice law, where got expose my identity? Still a secret lah! That one is Saucer, not me! Haha! iamthewitch, Maldives got fan right? Bali don't have! Beat Maldives already, haha!! Aiyo! How to bring back those sausage? By the time reach Malaysia, can throw already! Haha! cheahs@n, yes it's to die for! LOL! hey, this hotel looks really nice!! i mean the 1st photo on the exterior is already promising.. OMG!!! finally we are seeing more of foong already.. although still masking his face, at least we see the whole person!! the swimming pool is a mini one?? 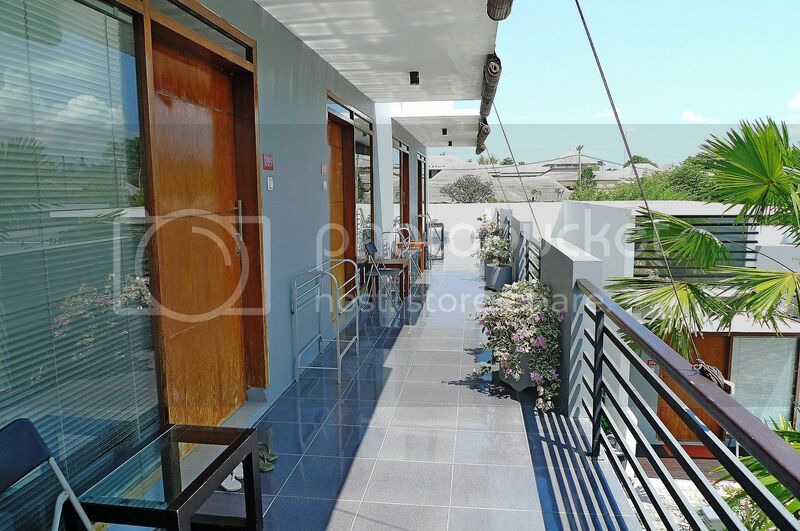 hmmm, but from your photo, it looks like a huge one woh..
and oh, there's a balcony too!! 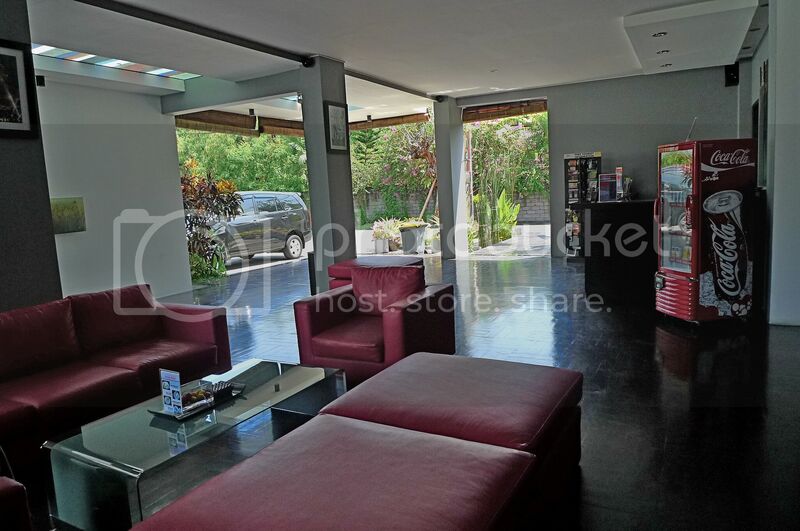 so nice, and they are all linked.. that means you are able to meet with your neighbours and chit chat a bit on the balcony.. this is very thoughful..
hehe, the lounge looks cool also.. i love that set of sofa, the color is so bold and striking.. very contemporary!! so who's that guy sitting there?? your friend?? 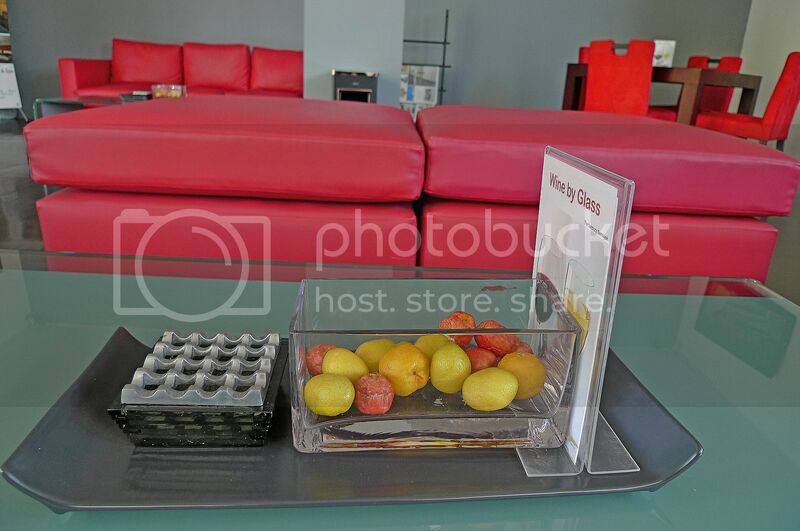 you mean those fruits are ashtray?? how do they work?? i thot the silver color container is ashtray..
so, i guess this hotel is for backpackers mostly?? cos from the way they design the restaurant, quite similar to the youth hostel i've been in lisbon..
hehehehe, and finally the most interesting part!! 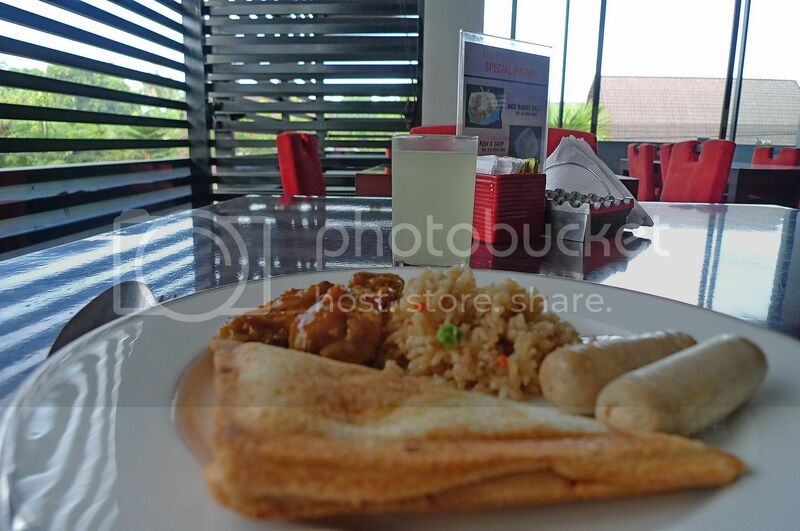 the breakfast.. yeah, breakfast is included!! 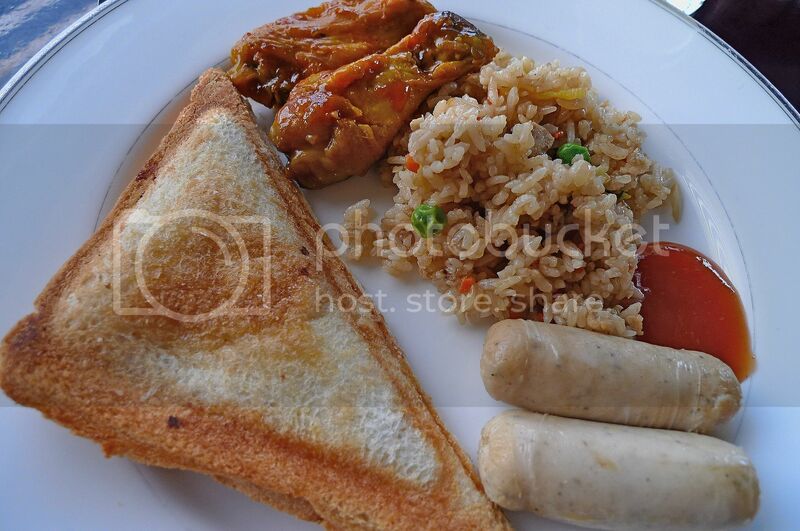 so nice..
the toast, sausages and wings all look very delicious to me!! if i were there, sure will have more than you were eating.. kekekeke!! i plan to go in may. my current boss's surname is foong as well. you know him? work in sg? Oppps, Ironman spotted in Bali....the blanked out face in the second photo! ha ha ha! post one of your blurred until mother also cannot recognize picture on blog, wtf..
and ya.. still not yet receive leh..
u got write attention "donna lim" ar? coz all the thing will pass to kaypoh costing, they will open everything for u one..
btw.. what did you send!!! i want challenge SK!!! but i dunno what to say anymore.. =.="
oh, the coding, SK sent, u understand or not? i am exhauted now.. =.="
SK, you like this hotel? 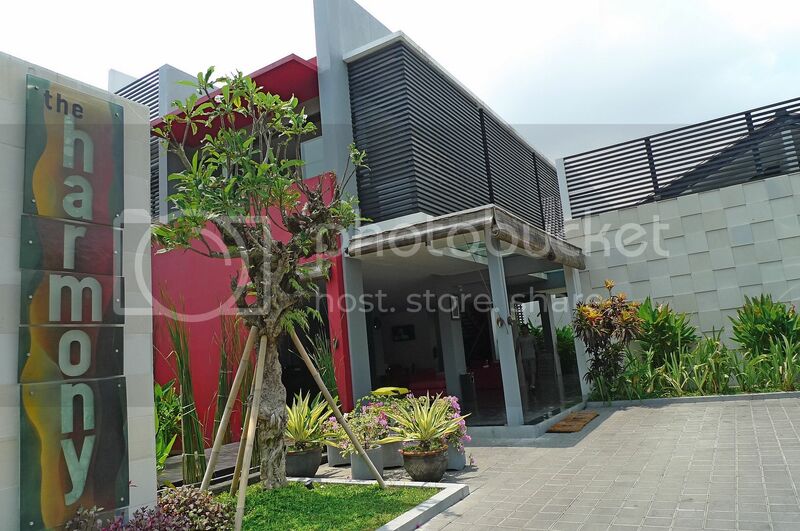 Maybe you should stay here next time you go Bali! Haha! If you want to see my face, the on;ly way is to meet up with me! LOL! You think the swimming pool is huge? Oh well, maybe we have different opinion regarding size! LOL! No, the fruits are not ashtray! Haha, you must be kidding me! The ashtray is next to the fruits! Yes, it's the silver container! I have no doubt you will eat more than me cos you are pretty greedy and chubby! Haha!! But that plate you see in the photo above - that's just my first round! Haha! faisal admar, sorry I have no idea cos I did not search on AirAsia's website! CH Voon, hello! Just because your boss is named Foong does not mean I know him! I do not know all the Foongs in the world! Haha!! rosebelle, prosperity flowers are more known as desert rose. No such flowers in your place? donna, still not yet receive? I sent you Jusco vouchers - I suspect either the postman took them or your office people took them!! Damn!! I have yet to read my email so let me read it first then only can comment - hope it's not too complicated! wah not bad la this hotel...it looks clean! huh? 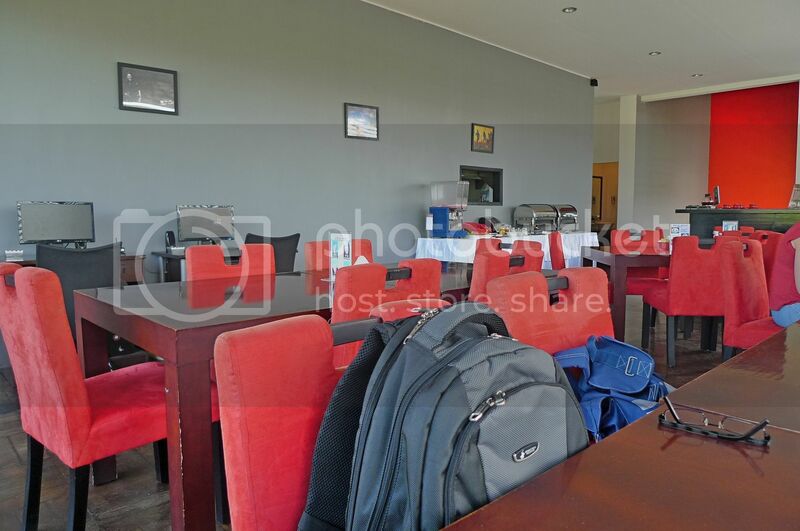 the dining area oso got no air con or fan? by the way foong.... i got your package today..
about the urinating statue... actually i am wondering why they are designed like that? are all fountains inspired by a urinating kid or guy? WAHHHHHH.. u send me what I need to most..
but dunno who stole edi..
lets hope the ppl who steal the voucher cannot pangsai for 3 days... hmmmmmm.. =..="
Didn't know Bali is this posh. Great hotel rate incl of breakfast. Looks like a nice place - clean, cosy and convenient. Very nice pictures, Foong. Thanks for sharing them. I'll have to agree with SK that the pool is not that small lah. In the first place, did you use it or not? I wonder what's the usage rate like. looks like a nice hotel but inside the room doesn't look cosy. I like the pee-ing statutes though! monica, yes it's a clean hotel! I also wonder how the front desk staff can tahan - I guess they are probably used to it! Haha! bluedreamer27, oh I looked like a statue because I was wearing brown? Haha! haha never mind the statue thing... yes i really like your gift foong it is soooooooooooo cute... thanks! Love the hotel's architecture but not the deco inside. I'm a huge fan of sausage too. Well, RM185 for me is considered luxury and expensive. I don't normally stay in hotel during traveling. 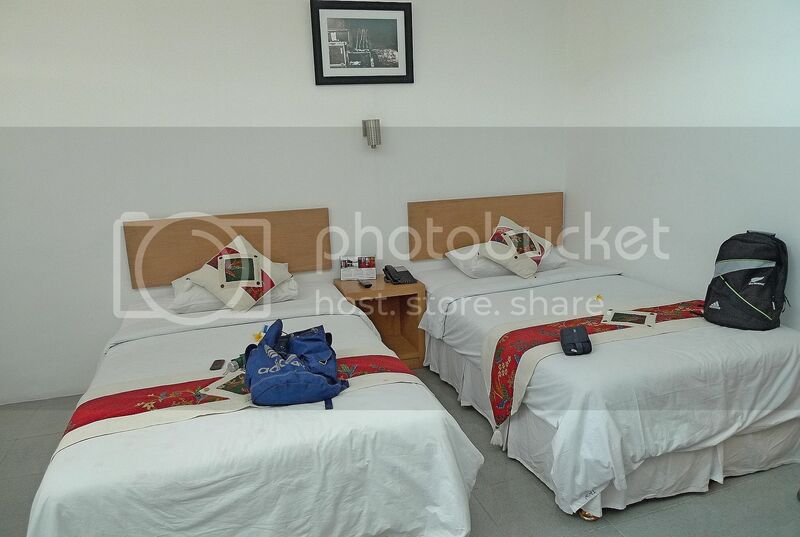 I would prefer to stay in guesthouse or hostel unless there is none in the place I travel to, but very unlikely. Hi all post of this site is looking very nice and also very beautiful share it again by again. This is one of the finest hotel that I have ever seen. The swimming is too cool. 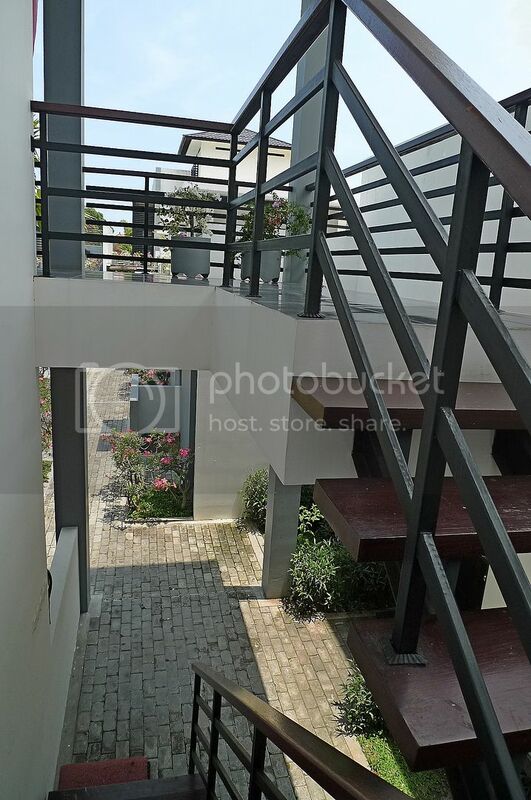 The staircase and the balcony near the room are too good to see. I hope that you enjoyed your holiday nicely in a lively and beautiful environment. oh how I love this post and such beautiful pictures!!! You and your food always make me laugh. You inspire me to travel even more and I love your desire for adventure!! !